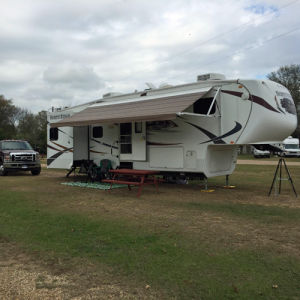 On December 10, we left Best Preowned RV, where we had been living for two and a half weeks while Serenity, our fifth wheel, was repaired from its blowout. We were grateful for the folks at Best Preowned for taking good care of our RV and being so hospitable by letting us stay on their lot for so long. But we were also ready to get going. Unfortunately, we were stuck for a while. Our truck had to be taken to the shop after spewing some thick white smoke and having a few other engine issues. Our RV had the floors replaced, chairs reupholstered, brakes inspected and damaged outside skirt replaced. Finally, on the same day we got the truck back, our RV repairs were completed. It was time for us to get on the road. 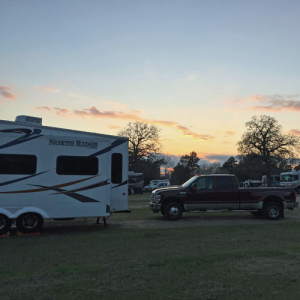 We hooked up the RV to the 5th wheel hitch for the first time, tested the connection, practiced moving the vehicle, then sat around in Houston, waiting for the rush-hour traffic to die down. Around 7pm, we started on the highway from Houston to Livingston, Texas. We had made reservations at Rainbow's End, where we had attended Boot Camp a few weeks previously. When we arrived, it was late. Fortunately, I had looked at the park map ahead of time to find the easiest route into our site. Unfortunately, what I hadn't taken into account was the fact that we would be pulling in backwards, with our electrical, sewer and water connections on the wrong side of the RV. A few minutes after we rolled in, a car approached. "Y'all are pointing the wrong way!" called the driver, who ended up being a helpful park employee. He led us around a few winding roads until we were correctly situated. Welp, you live and learn. When the sun was out, we got ourselves leveled, connected to the sewer and fully stabilized. Josh got our new flag pole up — more for getting awesome wifi than for showing our colors, but that was a nice side effect. The weather was beautiful, we settled into a routine of daily walks, and even used the grill. Life was good. 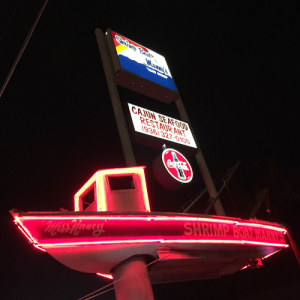 Livingston is a quiet town of about 5,000 people an hour and a half outside of Houston. But we found plenty to do to keep us occupied when we weren't working. 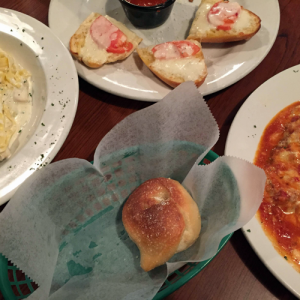 We dined at probably a quarter of Livingston's restaurants during our stay, but some of our favorites were Joe's Italian Grill — enough food for three meals — and Shrimp Boat Manny's. Small though it may be, Livingston was serious about its Christmas celebrations. 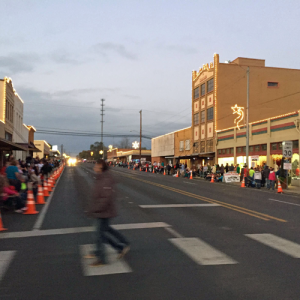 From a bedecked park and patriotic light display to a Christmas parade and Christmas market, Livingston did its best to ignore then 70-degree weather and get into the holiday spirit. 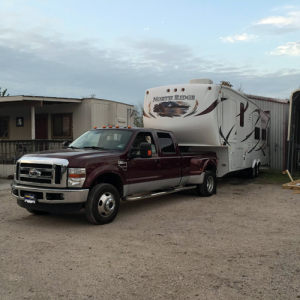 Our main RV-related task was to get both Dovahkiin and Serenity weighed and the fifth wheel's height measured. That process (through the Escapees' SmartWeigh service) is another blog post unto itself, but the bottom line is that we are definitely within a safe weight range. This is mostly important because it means we aren't putting too much strain on our tires and are less likely to have another blowout. After a week and a half at Rainbow's End, it was time to hit the road again, this time for Christmas in Amarillo. But that, too, is another post for another day. 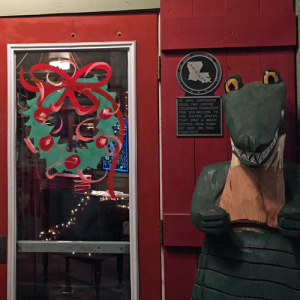 For now, happy holidays to all our readers! Have you stayed at an Escapees Park? How did you find the experience?